Car safety features have evolved and changed in leaps and bounds since the first automobile was built many decades ago. With the latest scientific research and technologies, cars continue to get safer and safer, all helped along my various governing bodies which oversee the manufacture of new cars by carmakers around the globe. Here are some key dates in the development of car safety features, laws, and testing practices. 1934 – General Motors performs the first barrier crash test. 1949 – The first ever crash test dummy, Sierra Sam, is created by the Sierra Engineering Co. under a contract with the United States Air Force, and was used to evaluate aircraft ejection seats on rocket sled tests. 1958 – The United Nations establishes the World Forum for Harmonization of Vehicle Regulations, an international standards body dedicated to advancing auto safety. 1956 – Ford tries to interest Americans in purchasing safer cars with their Lifeguard safety package. While not widely adopted, the initiative wins Ford Motor Trend Magazine’s “Car of the Year” award for that year. 1959 – Volvo becomes the first car maker to introduce the three point (lap/sash) seat belt as a standard fitting. It debuted on the Amazon and PV544 sedans. 1965 – Ralph Nader’s attention-stirring book, ‘Unsafe at Any Speed’ is published. The scathing report on the auto industry sparks mass debate worldwide into car manufacturing methods, and eventually leads to congressional hearings and automobile safety laws being passed in the US, including the National Traffic and Motor Vehicle Safety Act in 1966. 1970 – Australia passes laws in Victoria (followed by the rest of the country in subsequent years) which make it mandatory for the driver to wear a seatbelt, making Australia the first country to do so. 1979 – New Car Assessment Program (NCAP), introduced by the U.S. National Highway Traffic Safety Administration. 1997 – European New Car Assessment Programme (Euro NCAP) is founded by the Transport Research Laboratory for the UK Department for Transport. The Performance assessment programme is based in Brussels (Belgium) and is based on the NCAP crash testing methods. 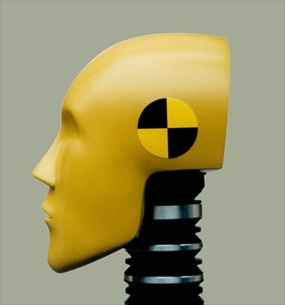 1999 – ANCAP adopts the Euro NCAP methods of testing new vehicle safety. 2003 – The Insurance Institute for Highway Safety (IIHS), an independent, nonprofit scientific organisation in the US, begins conducting side impact crash tests. 2012 – The National Highway Traffic Safety Administration (NHTSA) in the US unveils a new crash test dummy which represents a 10-year-old child. These new kinds of dummies will be used to evaluate child safety seats and boosters. No doubt, as technical advancements continue to improve, cars will continue to get safer and safer. With talk of self-driving cars, super advanced cruise control and other features popping up on the radar seemingly every week, it’s definitely an exciting area of the automotive industry that we’ll be keeping an eye on. What are your favourite developments in the history of safety in the automotive industry? Let us know in the comments below! Don’t forget to contact us at John Hughes for all your new and used car queries.